Private Well Abandonment Grant- The DNR administers a grant program for abandoning private wells. The total amount of the grant has recently been increased. It is income dependent but within a reasonable amount for the majority of homeowners. The Department encourages the abandonment of private wells that are not being used. They may be neglected, damaged, and become a conduit to groundwater contamination and affect other wells….especially public drinking water wells. To apply for a well permit, please print out and complete the attached Five Year Well Permit and send it to City Hall, P.O. Box 194, Chetek, WI, 54728. After hours emergencies, call 642-3029. Water, Sewer, and Garbage services are billed monthly on one statement. Utility bills are due the 21st of each month. Past due bills are subject to disconnection after the due date. If you wish to save the sewer charge on water you use outside, you may purchase a separate meter from the City of Chetek. The separate meter will keep track of the volume of water used outside. The cost to purchase the meter is currently $116.05. Once you purchase the meter, it is your responsibility to have it plumbed into your system. For more info, contact the Public Works Department 924-4236, City Hall 924-4838 or email the Utility clerk at chetekutility@chibardun.net. If you have questions or problems regarding your billing, contact the City Clerk's office Monday thru Friday from 8:00 AM to 4:00 PM, please call (715) 924-4838. 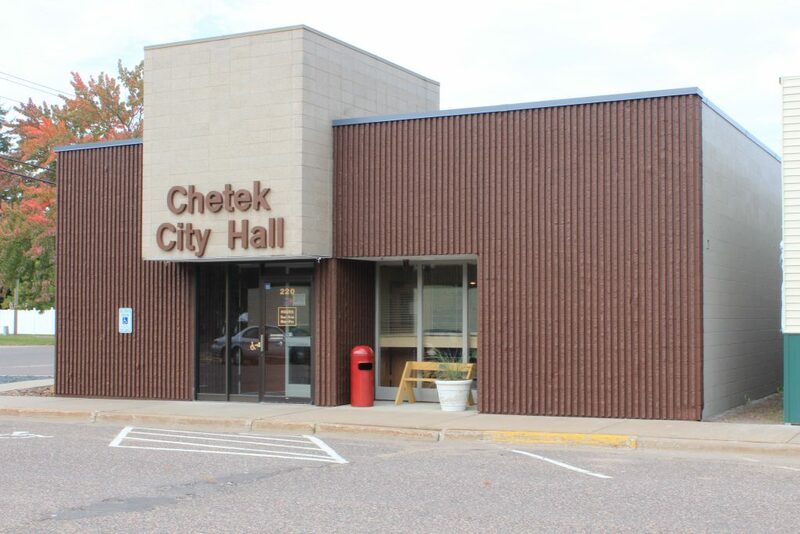 The City of Chetek established a Stormwater Utility. The City believes the management of stormwater and other surface water discharges affect the local lakes and rivers systems. This is a matter that affects the health, safety and welfare of the City, its citizens and businesses, and others in the surrounding area. Stormwater discharges within urban areas are contaminated in various degrees by nitrogen and phosphorous, heavy metals, suspended solids, bacteria, and solid waste materials. Failure to effectively manage stormwater also affects the sanitary sewer utility operations of the City by, among other things, increasing the likelihood of infiltration and inflow into the sanitary sewer system. Prior to the Stormwater Utility, all stormwater improvements and projects were funded solely by the general taxpayers of the City. Storm drain replacement and curb and gutter installation costs, for example, have always been included and budgeted in with street reconstruction projects. Street Project capital expenses, of course, are included in the total City of Chetek tax levy on all taxable property owners. Tax-exempt properties such as governmental offices, schools, hospitals, etc., however, did not pay taxes and, therefore, did not contribute to the costs of such improvements. Stormwater Utility effectively spreads the costs of stormwater management over all benefiting property owners-not just the taxpayers. All property owners now pay for municipal stormwater services, not just taxable property owners. The Utility is more equitable than funding services through general taxation. The fee is based on stormwater contribution, not property value, and it is a more equitable match between the cost and the level of service provided. How equitable would a municipal water or sewer system be if it were based on property value? The Stormwater Utility is operated similar to our Sewer Utility and Water Utility. Revenues from the Stormwater Utility are used to provide outreach and education, detection and elimination of illicit discharges, and construction of water quality treatment systems. The first Stormwater Utility charges were on the monthly utility bills starting in 2006. All single family homes are charged a fixed rate per month. Commercial, industrial, public authorities, schools, churches, and other establishments are charged based on the amount of the property's impervious surface when compared to a typical residential user. A credit system has been proposed for the Utility, which would give credit for certain stormwater improvements on a property. The proposed credit system would provide users with an opportunity to reduce stormwater inputs, and, thereby, reduce the requirements of the City to treat property run off issues. Please see the City of Chetek Ordinances (chapter 106) for more information on the Stormwater Utility.